This year, I left my hometown of New York City to go west to Los Angeles for the holidays. I took my PS4 with me to a friend's house—in the hopes of making a dent in my personal backlog—but wound up barely touching it in the 10 days I was away. But I did something better: I talked about video games with strangers. A few months ago, my girlfriend and I decided to shift holiday locales to not freeze our fingers off, let our daughter hang out with another preschool-aged buddy and give her a first-ever Disneyland visit for her birthday. For me, it also meant dinner parties and brunches with uncles where I got to explain what I do for a living to people I'd never met. The friends I have in NYC all know my deal by now and have heard me wax on about video games for years. But this year when the inevitable "so, what do you do?" question came up, people who don't live with video games day-in, day-out asked me questions and even reminisced a bit. One fellow dad I met in LA told me that he was straight-up scared of video games. Their potentially addictive power was the boogeyman for him. He'd heard stories about kids and adults pumping thousands of hours—and, scarier still, dollars—into video games. Keeping his kids from games' strong gravitational pull was already something he was worrying about. I tried to assuage him by reminding him that he could treat games like any other media and set the same boundaries that he would for TV or other screentime. Just because games are designed to pull users into their worlds in unique ways doesn't mean a parent has to throw up their hands in anguish. Speaking of throwing up hands in anguish, lots of people did that when PSN and Xbox Live got taken down on Christmas Day. The outage caught the attention of CNN, who invited Kotaku to talk on air about it. Before going on the news segment about the attack, I explained to the friends whose bedroom I'd be Skype-ing in from what a DDoS attack was, along with why that kind of internet machine assault can be difficult to repel or withstand. Couldn't those people who got or bought a new PS4 or Xbox One just play their new games without those online services? Highly unlikely, I told them. Even if the games in question didn't need to shake hands with a server somewhere to become playable—like, say, Destiny—they wouldn't be at their best without the crucial day-one patches that are all too common nowadays. 'Whoa,' some of these long-lapsed players or curious-but-never-experienced listeners said, 'we really are a long way from the days of blowing into a cartridge to make a game work.' Yep, we sure are. And while the roller coaster evolution of game design over the last few decades has resulted in ever-more complex considerations like infrastructural security and gigabyte-sized updates, it's also widened horizons. Two of the best conversations I had about video games were with a writer of structurally challenging and thematically complex novels. He'd owned a Commodore 64 back in the day but had long since stopped paying attention to the leaps game-making had taken. But he'd heard encouraging things, he told me, and took a chance on Limbo. He loved PlayDead's morbid sidescrolling classic—not a surprise to anyone who's played it—and braced me for recommendations of games that would hit him the same way. The notebook and pen pulled out of his back pocket were evidence of his seriousness. He wasn't just making small talk. God's honest truth and no lie: the simple act of remembering enough to talk up Papo & Yo and Brothers: A Tale of Two Sons got me seriously choked up. I fought off the temptation to blather on and spoil the endings of either game, deciding instead to home in on how each game used its design to create playable metaphors about human relationships. Yes, this is the stuff he wanted, writer-guy told me. Were they available on Steam? Hell yes, they are, I said, along with another great game called This War of Mine. He scribbled that into his notebook, too. I urged him to ping me with his thoughts on these games and he said he would, though it might take a while. Don't leave me hanging, Mark. In a British-style pub where expats and Americans cheer for their favorite Premier League teams, I sat down on Boxing Day with an English teacher who wanted to know if getting Shadow of Mordor for his collegiate, Xbox 360-owning son was a good choice. Great game, I said, but I related how colleagues found the version for the older Xbox console to be inferior. Our talk turned to how he was a big movie fan and especially fond of work created in the 1970s, an era where the studio-driven chokehold on filmmaker creativity loosened considerably. A former student of his wrote an essay about how the much-lauded films and directors of that era were overrated. This kid was a contrarian, he offered, and was probably looking to provoke sharp reactions with his thesis. But if he could back up his premise, I countered, he might actually change some minds. Last fall's controversies came up, too. The teacher and other people I spoke with seemed puzzled that a desire to make video games broader, deeper and more inclusive as a medium would make people—and women, in particular—into targets for death threats and vicious online harassment. Maybe we all had short or shallow memories but it didn't seem like the growing pains of other creative media like television or film were quite as volatile. It reminded me of another chunk of conversation I had with writer-guy Mark, where we talked about when our adolescent passions for reading first caught flame. Back then, I'd read the stuff my English teachers told me to read but veered off in search of writers who documented the world from a point of view more like my own. I'd talked about how I'd read searing works of the Black literary traditions Richard Wright's Native Son and Invisible Man under my own steam and how my understanding of them changed once I went to college. Getting fed info about the context of the times that those novels were created in helped me understand that they were part of a longer dialectic concerned with the portrayal of Black lives through the centuries. And then the expected-yet-still-killer question: had video games ever delivered such insights to me? Well, as far as a historical context, I could point to two Assassin's Creed games (Liberation and Freedom Cry) that tried and largely succeeded. 'Were there any games that aimed for the same goal—the portrayal of Black lives—in a present-day setting?' I was asked. Not a one that I could recall. Still lots of work to do there. I'm sure I've forgotten conversations I had while on vacation. Speed-running came up once and I remember talking about Twine games as something that choose-your-own-adventure readers would find familiar. I know for sure some of the people I talked to in Los Angeles over the last two weeks will be playing things that I recommended. And I recommended the Mass Effect games for someone who wanted a Star Trek-style feeling to their re-entry into gaming, talking up the infamous Wrex standoff scene from ME1. Others said they'd had no idea that video games had mutated so much since their own youth. Not only do most games look different than they used to, people replied, it seemed like they feel different, too. It's easy to miss the shifts in an entire medium when you live inside of it on a daily basis but stepping away from my job reminded me there's still a lot of wonder to be had in video games. And it's a safe bet that more is on the way. 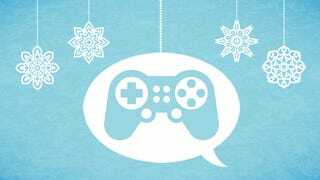 Did you have any conversations worth talking about about video games over the holidays? Share them in the comments below.